With the high cost of construction, there is no better alternative for saving money than to Refinish your Cabinets. 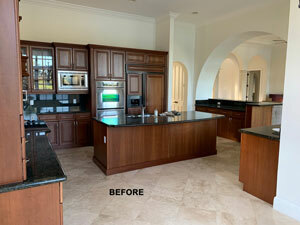 Refinishing or resurfacing your Kitchen Cabinets can save you upwards of 80% of the cost of replacement!! It doesn't matter if you have wood or Formica Cabinets, Frank All Surface Refinishing can Refinish them with bright modern colors that will make them look new again. Many times Kitchen Cabinets become chipped, scratched and dull. On older wood Cabinets, the stains and varnishes begin wearing away. The wood looks "tired" and dated. The coating that we apply will last many years. We can do this in any color you want! We have been Refinishing and Resurfacing cabinets for almost 20 years!! We are so confident in our process that we will give a Lifetime Guarantee against any type of peeling. All of our coatings are the result of the latest technology available. We use a two part resin coating that dries to a beautiful satin finish. Everything is applied with a HVLP Sprayer that leaves no brush or roller marks that sometimes results with do-it-yourself kits. Sometimes customers become confused about the differences between Cabinet Resurfacing and Cabinet Refacing. Often time’s homeowners believe the only alternative to a new kitchen besides replacement is to change out their Cabinet doors and apply new Formica to the Cabinet boxes. This is not the most economical alternative and it may take weeks to complete the job. Most of the time homeowners are very satisfied with a change of color. There is no reason to replace the doors just to change the color. With Cabinet Refinishing, you get the look of a new Kitchen at half of the price! Take a look at some of our work and you will see how dramatic the change is. 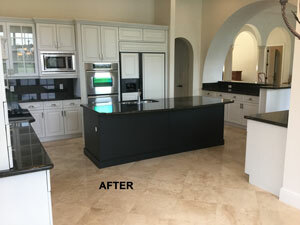 Why replace your Kitchen or Reface the Cabinets when you can achieve your desired results for half of the cost. Most Cabinet jobs can be completed within 2 to 3 days. All work is completed on site and you will be able to use your Kitchen the next day. If you want to see some of these dramatic results for yourself, call Frank for a free estimate. He will come out to your house and explain the entire process. You will receive a FREE written estimate for the work. The results are dramatic.